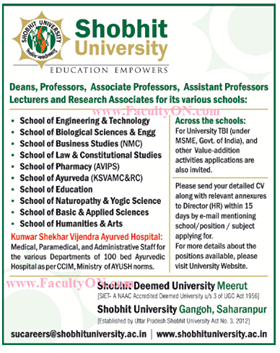 Shobhit University, Meerut has advertised in THE TIMES OF INDIA for the recruitment of Professor/Associate Professor/Assistant Professor job vacancies. Interested and eligible job aspirants are requested to apply with in 15 days. Check out further more details below. About College: Shobhit University believes in strategic growth as envisaged in our mission and vision, to impart quality education through vertical and horizontal integration. It strives to become a world class university, with a global perspective, that educates the future leaders of the world. Therefore, the challenge before the University is to remain in the forefront of cutting edge knowledge and to follow the best international practice(s) in academics.